This past week the Salvadoran people led two protests against plans for private corporations to privatize the water of their country. On June 14th, hundreds of students from the National University of El Salvador (UES) -at the bequest of the rector himself- set out at 7:30am to march to the national legislative assembly. That morning, the assembly was holding a plenary session in which right wing representatives and the rich elite were discussing just how they will go about making water a commodity. They men sitting in that room knew exactly that what they were plotting was going against the wishes of the majority of the Salvadoran people. With the help of three of FMLN representatives, the students peacefully gained access to the steps of the national assembly and intended to request an audience with those handful meeting to discuss the fate of the many. They not only declined but were met with pepper spray and violence. No apologies were given, in fact, Norman Quijano, the president of the Legislative Assembly, held a press conference where he accused the University’s rector, Roger Arias, of being a terrorist. This past Saturday, an estimated 10,000 took to the streets for a massive protest where the message was clear “The people say no to the Privatization of water in El Salvador.” This protest began and ended peacefully and included all sectors of Salvadoran society. Privatizing is nothing new for the right-wing elite in El Salvador, who have since 1991, privatized the banking system, the telephonic system and pensions. None of these have come with guarantees, transparency or benefits to the Salvadoran poor and working class. It is not an ideology but the evidence: privatization in El Salvador has ruined more than it has built. To those in control, water privatization is the final step in gaining full economic control and due to past legislative election, unfortunately it may come to fruition, but not without a full resistance from the Salvadoran population who may still have the ability to upset this diabolical decision if the pressure is constant. The report can be found online HERE and you can find the report they published last year on the same subject HERE. As Celia Medrano, CRISTOSAL’s chief program officer stated in her opening remarks, that “while it important to create an multi-setor response, this phenomena must be an immediate priority for the Salvadoran government. In 2017, 701 cases were recorded by both CRISTOAL and Fondation Quetzalcoatl. The majority of victims were women, with two or more children to care for, and hailing from the paracentral region of the country, specifically San Salvador and Soyapango; two regions ravaged by activity. Reasons for displacement vary but the report has identified the three major motivators in El Salvador to be direct threats, homicides and attempted. Many instances of forced displacenmtn are not recorded due to fear of retaliation or lack of confidence in the governments abilities to protect them. The report describes how the majority of these victims wish to stay not only in El Salvador, but in the same states, as to not loose their occupations and support systems. Still, the United National Refugee Agency (ACNUR) has reported a significant increase in Salvadoran asylum seekers, as seen below. Tomorrow on July 24th, 2017, myriads of people from communities throughout the country will gather in San Salvador to denounce the right-wing private business association law that would see them having control over water in El Salvador. This action is just one amidst an ocean of resistance happening in big cities and small towns across the country to fight to protect natural resources and human life. The Movement of Victims Affected by Climate Change and Corporations (MOVIAC) will hand out the following flyers to all who attend. (Haga clic derecho para descargar). Mañana, el 24 de julio de 2017, cientos de personas de comunidades de todo el país se reunirán en San Salvador para denunciar la ley del aqua presentada por la derecha y la asociación de negocios privados que les permitiría tener control sobre el agua en El Salvador. Esta acción es sólo una en medio de un mar de resistencia que ha estado ocurriendo en las grandes ciudades y pequeños pueblos de todo el país para luchar por proteger los recursos naturales y la vida humana. El Movimiento de las Víctimas Afectadas por el Cambio Climático y las Corporaciones (MOVIAC) entregará los siguientes folletos a todos los que asistan. In 2002, the Canadian corporation Pacific Rim registered in El Salvador. It was invited by the Salvadoran government to exploit the potential of the country in terms of gold and silver. Pacific Rim identified at least 25 favorable sites for the extraction of gold, in the beginning of its explorations. One of these sites is known as El Dorado, in the department of Cabañas. In December 2004, the company formally requested permission to operate the El Dorado mine, but the government denied permission for inconsistencies in the environmental impact study, and because the company did not have the authorization of the owners of the land where the exploitation of gold and silver would be carried out. In response to the Salvadoran government’s refusal to grant the El Dorado project exploitation permit, in July 2008, Pacific Rim filed a lawsuit against the Salvadoran government through the World Bank’s International Center for Settlement of Investment Disputes (ICSID). The company demanded El Salvador pay them $77 million for the amount invested before they were denied the authorization permit. Later this requirement was increased to $301 million and finally reduced to $250 million. At the end of 2013, Pacific Rim filed for bankruptcy and sold its shares to the Australian transnational company Oceana Gold, which continued the lawsuit process. After a long litigation, on October 14, 2016, the international court ruled in favor of the Salvadoran government and against the mining company. The verdict also determined that the company must compensate with $8 million to the Salvadoran government to cover the procedural costs of the litigation. Following this ruling, on November 24, 2016, the Movement of Victims Affected by Climate Change and Corporations (MOVIAC), submitted a letter to the Legislative Assembly requesting a ban on all metal mining in the country. This request opened an intense debate that is increasingly gaining strength. On February 6, the Central American University José Simeón Cañas (UCA) and the Catholic Church presented a proposal for a law to ban metal mining. The request for a ban is justified by the serious social and ecological impacts caused by the mining industry and by the high degree of pollution and environmental deterioration that the country is currently suffering. According to international experts, El Salvador is the country with the most environmental deterioration in the continent, after Haiti. The United Nations has described El Salvador as the country with the least amount of water available throughout the continent, while the Ministry of the Environment has reported that more than 90% of surface water is seriously contaminated and only 10% are suitable for use as potable. This water crisis could become much more serious if gold and silver mining projects are located in the basin of the river Lempa, which is the most important river in the country. Its basin makes up 50% of the national territory, and houses 70% of the country’s population. El Salvador is the only country in Central America that does not have mineral exploitation and in an opinion poll conducted by the UCA in June 2015, 76% of the population is against the opening of mining projects. Despite this opposition, there is great pressure from transnational companies to initiate gold and silver mining projects. This of course is due to the findings from Pacific Rim that discovered approximatly 1.2 million ounces of high-purity gold and more than 7.5 million ounces of silver in the subsoil of the northern part of the country. In addition to another 558 thousand ounces of gold and 1.2 million silver of lower quality. Apparently this is a good thing; however, experience in neighboring countries such as Guatemala and Honduras demonstrates how harmful the mining industry is to people and the environment. Especially when it comes to water resources. According to a recent UCA publication, the Marlin mine in Guatemala uses about 6 million liters of water per day; and nearby communities have reported 40 dry communal wells in the eight years of the mine’s operations. Likewise in the region of Valle de Siria in Honduras, the San Martín mine has dried 19 of the original 23 rivers in the area throughout its’ nine years of operation. For all these reasons at the moment, in El Salvador there is a strong debate about the need to pass a law that definitively prohibits metal mining. En el año 2002 la corporación canadiense Pacific Rim se registró en El Salvador, invitada por el gobierno, para explotar el potencial del país en cuanto a oro y plata. Desde el inicio en sus exploraciones, la minera identificó al menos 25 sitios propicios para la extracción de oro, uno de estos es el lugar conocido como El Dorado, en el departamento de Cabañas. En Diciembre de 2004 la empresa solicitó formalmente el permiso de explotación de la mina El Dorado, el gobierno negó el permiso por inconsistencias en el estudio de impacto ambiental y porque la empresa no contaba con la autorización de los propietarios de las tierras en donde se realizaría la explotación del oro y la plata. Ante la negativa del gobierno salvadoreño de no conceder el permiso de explotación del proyecto El Dorado, en julio de 2008Pacific Rim inicia una demanda contra el Estado salvadoreño, en El Centro Internacional de Arreglo de Diferencias Relativas a Inversiones (CIADI) del Banco Mundial. La petición pedía que el Estado salvadoreño le pagara $77 millones de dólares, por el monto invertido antes de que se le negara la autorización de explotación, más tarde esta exigencia fue incrementada a $ 301 millones y finalmente se redujo a $ 250 millones. A finales de 2013, Pacific Rim se declaró en quiebra y vendió sus acciones a la transnacional Australiana Oceana Gold, quien continuó el proceso de demanda. Después de un largo litigio, el 14 de octubre de 2016, el tribunal internacional falló a favor del Estado salvadoreño y en contra de la empresa minera. El veredicto también determinó que la empresa deberá indemnizar con 8 millones de dólares al gobierno salvadoreño para cubrir los costos procesales del litigio. A raíz de este fallo, el 24 de noviembre de 2016 el Movimiento de Víctimas y Afectados por el Cambio Climático y Corporaciones MOVIAC, presentó un escrito a la Asamblea Legislativa solicitando la prohibición de la minería metálica en el país. Está petición abrió un intenso debate que cada vez está cobrando más fuerza. El 6 de febrero la Universidad Centroamericana José Simeón Cañas, UCA y la Iglesia Católica presentaron una propuesta de ley de prohibición de la minería metálica. La solicitud de prohibición se justifica por los graves impactos sociales y ecológicos que ocasiona la industria minera y por el alto grado de contaminación y deterioro ambiental que ya sufre el país. Según expertos internacionales El Salvador es el país del continente con mayor deterioro ambiental, después de Haití. Las Naciones Unidas ha calificado a El Salvador como el país con menos disponibilidad de agua de todo el continente, y el Ministerio de Medio Ambiente ha informado que más del 90% de las agua superficiales están seriamente contaminadas y que sólo el 10% son aptas para potabilizar por medios convencionales. Esta situación de crisis hídrica podría ser mucho más grave si se concretan proyectos de explotación de oro y plata ubicados en la cuenca del río Lempa, que es el río más importante del país, su cuenca comprende el 50% del territorio nacional, en donde habita el 70% de la población del país. El Salvador es el único país de Centroamérica que no posee explotación de minerales y en una encuesta de opinión realizada por la Universidad Centroamericana UCA, en junio de 2015, el 76% de la población está en contra de la apertura de proyectos mineros; no obstante se tiene gran presión de empresas transnacionales para iniciar proyectos de extracción de oro y plata, ya que según la exploraciones realizada por la empresa Pacific Rim, en el subsuelo de la zona norte del país existe un aproximado de 1.2 millones de onzas de oro de alta pureza y más de 7.5 millones de onzas de plata. Además de otras 558 mil onzas de oro y 1.2 millones de plata de menor calidad. En apariencia esto es algo bueno; sin embargo, la experiencia en países vecinos como Guatemala y Honduras demuestra lo dañina que es la industria minera para las personas y para el medio ambiente, especialmente en el recurso hídrico. Según una publicación de la Universidad Centroamericana, UCA la mina Marlín, en Guatemala utiliza unos 6 millones de litros de agua por día, las comunidades que viven cerca reportan 40 pozos comunales secos en los ocho años de operaciones de la mina; así mismo en la región Valle de Siria en Honduras la mina San Martín en nueve años de operaciones ha secado 19 de los 23 ríos originales de la zona. El interés de la industria minera al que hace referencia la PDDH se manifiesta en una serie de acciones que lleva a cabo la empresa minera Oceana Gold, las cuales el Movimiento de Víctimas y Afectados por e Cambio Climático y as Corporaciones, MOVIAC ha denunciado en reiterada ocasiones, por ejemplo en una carta entregada a la Asamblea Legislativa el 24 de noviembre de 2016, el MOVIAC expone: “Conocemos que en todos los países empobrecidos del mundo, las transnacionales mineras emplean las mismas estrategias: división de las comunidades, asesinato de ambientalistas, compra de funcionarios corruptos y campañas mediáticas mentirosas como lo son las promesas de generación de empleo y de desarrollo social. La verdad es que la minería no genera más empleo que el que destruye, donde hay minería no hay agricultura, no hay ganadería, no hay turismo, no hay salud, no hay comunidades pacíficas ni libres”. Por todas estas razones en el momento actual, en El Salvador se debate fuertemente la necesidad de aprobar una ley que prohíba definitivamente la minería metálica. Voices had the pleasure of hosting a delegation from Carlos Rosario, a public charter school for adult immigrants in Washington, D.C. 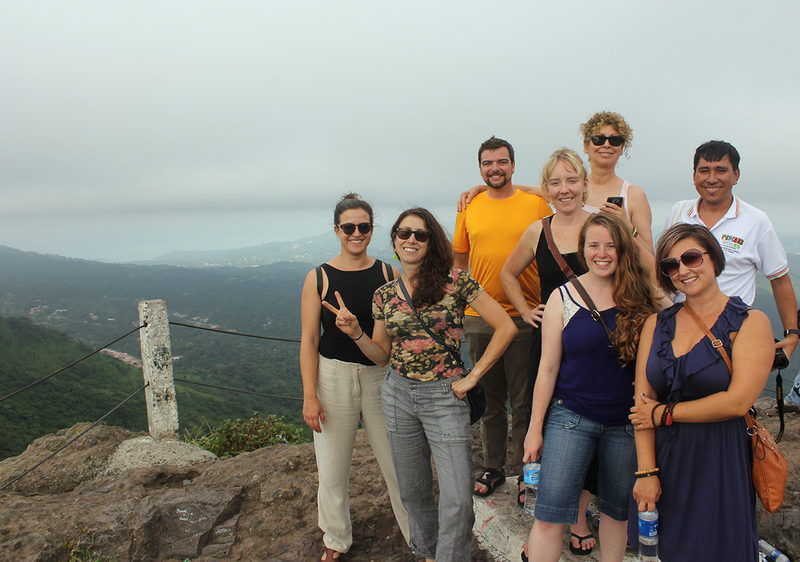 Seven of their staff came down to El Salvador, where a majority of students are from, in order to learn about the country and better understand their students’ roots. The delegates’ objective was to explore the broad reality of Salvadoran culture, economics and education as well as the dynamic effects that migration has on individuals, families and communities. 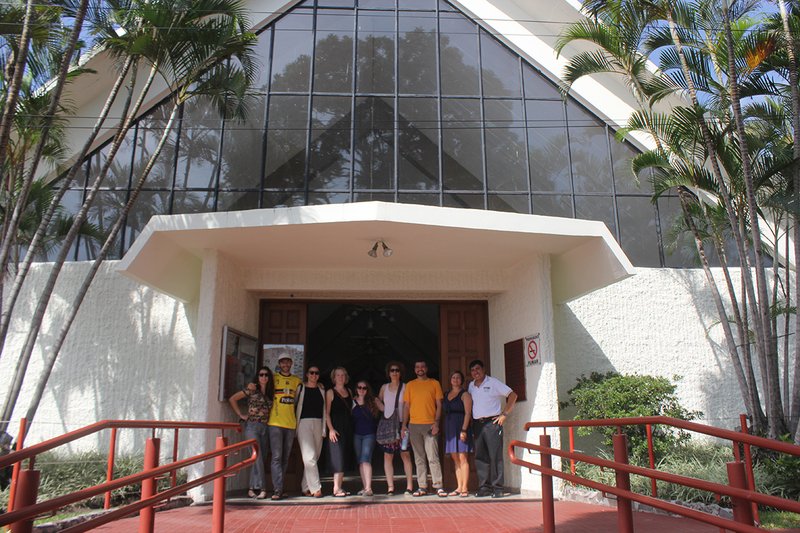 After receiving a detailed explanation of the people’s history of El Salvador, they met with the Vice Minister of Education, Teacher’s Union Leaders, a human rights defender, visited the National Cathedral, the UCA, toured the Museum of Words and Images and bought a lot of good reads at Equipo Maiz. Then they traveled to Morazán where they talked with the pastoral team of Community Segundo Montes about the 9 years they’d spent in the refugee camps in Colomoncagua, Honduras. They got a thorough overview of the civil war at the Museum of Revolution in Perquin and reflected heavily after visiting El Mozote. In the lower Lempa River region, they stayed with hosts families in Amando Lopez and experienced life in agriculture based communities there and along the coast. They visited with local community leaders and teachers to hear their perspectives on development and education in the region, they donated much needed supplies to three separate schools and before it was all done they taught a class! The group was delightful. They asked great questions, covered a lot of ground, offered helpful suggestions, participated in meaningful dialogue and gave a gift to nearly everyone they met. Carlos Rosario, thank you and keep up the good work in D.C. | READ THEIR BLOG!